As a teenager I was very good at skateboarding. This was before the technology of super light boards and thus before all the hopping and kick flips. Living in San Francisco we skated down hill using slalom and sliding techniques on both streets and sidewalks. I can count on one hand the number of people that could keep up with me. Whenever I size someone up, of course I look at the usual stuff: their alignment, do they look weak in some areas and stronger in others? what kind of reach do they have? but the big question is, could they do something to me that would hurt more than falling off my skateboard at 30 miles an hour onto the pavement and then sliding to a stop? I don't personally take credit for inventing the word "gnarly" but many of my friends at the time were convinced that I had a claim to first usage. You can tell someone who is just learning how to skateboard because he or she will try to use their leg muscles to steer (and because they will say, "ahhggrrhh" and then fall down.) 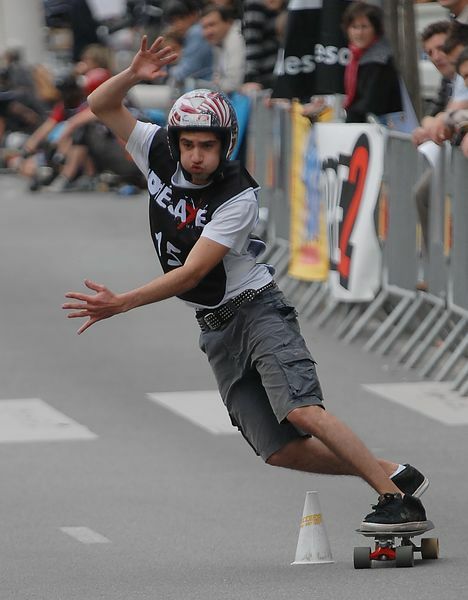 Downhill skateboarding requires using the whole body to balance and steer. Balance is not something you find and maintain, it is the ability to constantly shift your weight around. To someone watching a skateboarder doing slalom down a hill it looks like he or she is leaning forward and back. Actually what happens is the instant one moves their weight to one side of the board, the board starts turning to come underneath the weight. This creates first a feeling of heaviness as your weight goes into the board, and then a feeling of lightness as your forward momentum takes you over to the other side of the board. As your weight crosses the centerline you feel weightless for a moment and then you come down heavy on the other side of the board as it turns again. This heavy-light-heavy sequence is what wins fights. Think about the key moment of a martial encounter in which your body weight comes into full contact with the other person. Just like skateboarding, if you try to use your leg muscles to balance, you will be bowled over. Balance comes from being able to become suddenly light then suddenly heavy. One high level description of this is that you first throw a very fine light weight silk blanket over your opponent, then you throw a very heavy one.